Okay. TMG does not review musical stage productions. But this is my website and I can pretty much do what I want. 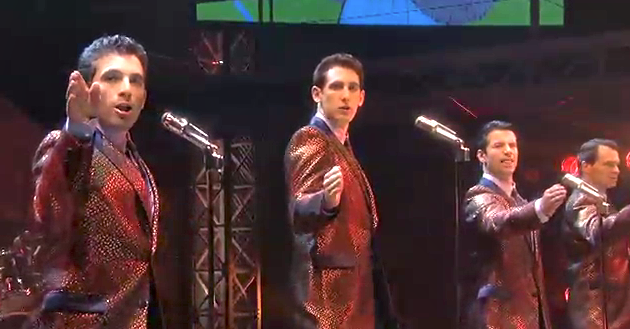 Jersey Boys has been on Broadway in New York since 2005 and on national tour for quite awhile. [The movie version is in development] Not being one to rush right out to a new musical [I am an old dance man from summer stock musicals in Kansas City], I just saw the show last night in Kansas City. It was awesome! Rush out to buy your tickets today. It stays in Kansas City until May 20, 2012 at the downtown Music Hall. In case you have lived under the same rock where I live, Jersey Boys is the musical history of Frankie Valli and the Four Seasons. The band entered the Rock and Roll hall of fame in 1990. They had incredible hits, unmistakeable voices, and dance moves for the ages. [My brother Eddie did an incredible imitation of Frankie Valli signing Big Girls Don’t Cry] Valli is still alive at the age of 78. Born in Newark, New Jersey (hence “Jersey Boys”) Valli along with Tommy DeVito, Nick Massi, and Bob Gaudio now reign immortal. The musical can be enjoyed by anyone. The dancing really carried me. I have not seen dancing this good since watching Bruno Mars at the Grammy’s this year. The only negative is the gratuitous use of the “F” word throughout that makes this show unsuitable for kids and it’s too bad. Some use of the word works comedically and is realistic for the show, but it could have been used a lot more sparingly and had greater dramatic effect. Other than that, you are denying yourself an incredible evening if you don’t make one of the touring shows. Take a date and Walk like a Man to see Jersey Boys. Take me. I would definitely go again!